My birthday was this week, and my awesome parents went overboard and got me a Kindle Fire . This led me on a search for the perfect cover to protect it since I’m now paranoid about its safety. Everything I found either cost too much, took too long to ship, or just wasn’t interesting enough. Thanks to ideas I found on Pinterest, I decided it would be quicker and cheaper just to make one. These directions can easily be adapted to hold any e-reader or tablet. I learned a lot of things during this project. The main thing I learned is that it is always harder to make the first one, and it is probably better to have a complete plan to start with, and to measure things more. I kind of just winged it. Hopefully, some of my issues will save you some trouble if you try this or at least help with your project. I found two pieces of this cute fabric at a thrift store for $0.50 and got an appropriately sized, nicely bound hardcover book for $1. All the other supplies I had on hand. I started by carefully removing the pages of the book with a box cutter. 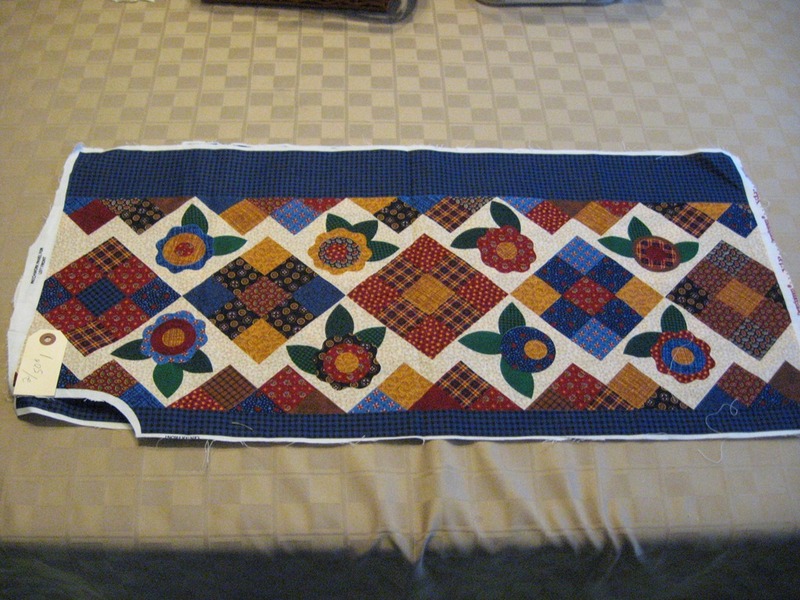 Then I created the lining, as shown below. I took two pieces of black fabric I had and cut them at leat an inch wider on all sides than the cover of the book. Then I cut a strip of the fabric about 1” wider than the book’s binding. This could all be one piece, but I wanted the loop and pocket, and I thought it would be cuter this way. I cut a small piece of black elastic and looped it to the proper size to hold a stylus or pen, then sewed it between the middle and one side, sewing the whole sides together. On the other side I cut a piece of the cute fabric the same size as a black piece, folded it in half, sandwiched it between that side and the middle strip, and sewed the sides together. After that I laid the Kindle on the side it would lay on and used a fabric pencil to plot out where to put the elastic bands that would hold it in place. 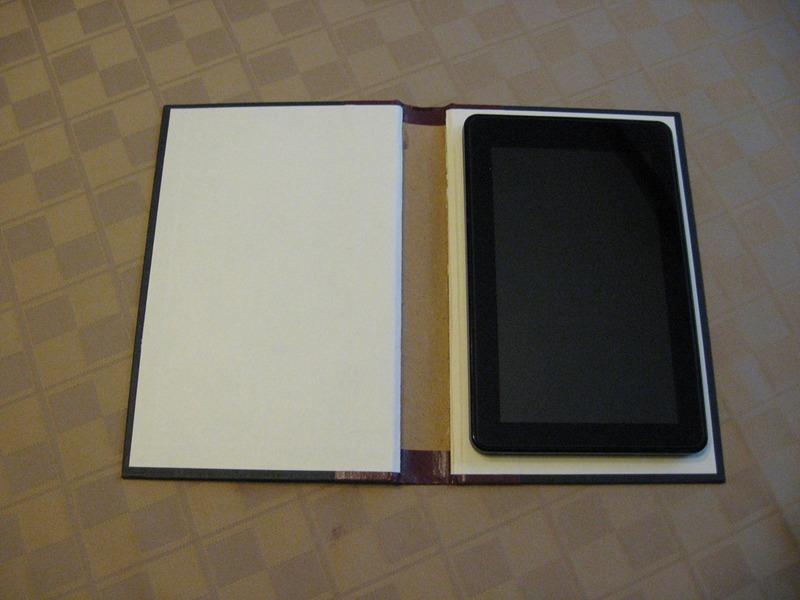 Then I sewed it on, making sure the length of elastic gave the appropriate tension to hold the Kindle securely. It isn’t pretty, but the Kindle covers the loose ends. Next I used spray adhesive to glue this lining to the inside of the book. I don’t know if it will stay permanently stuck, but it keeps it from moving while working on it. When it is finished, the binding holds it in place. 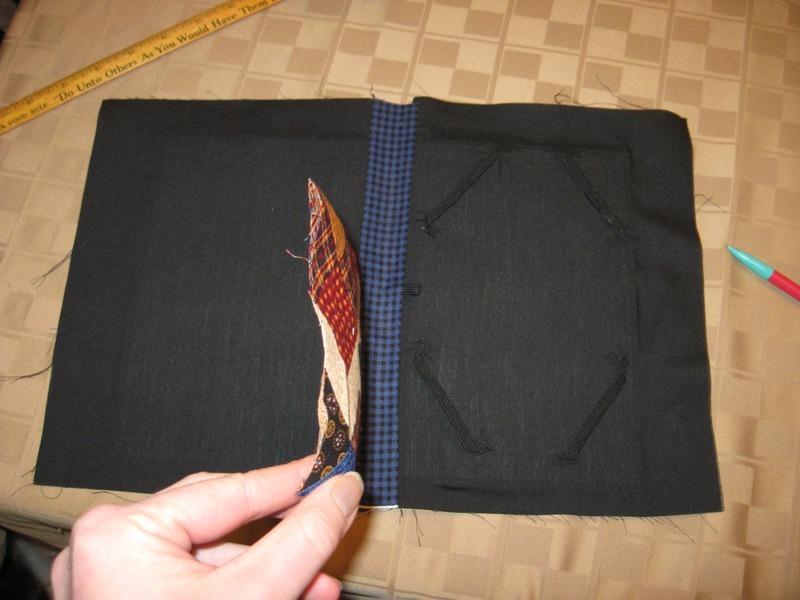 As you can see, the “pocket” is only sewed on one side so far. I flipped the book over and cut 3 identically sized pieces 1.5” wider or so on all sides than the book. 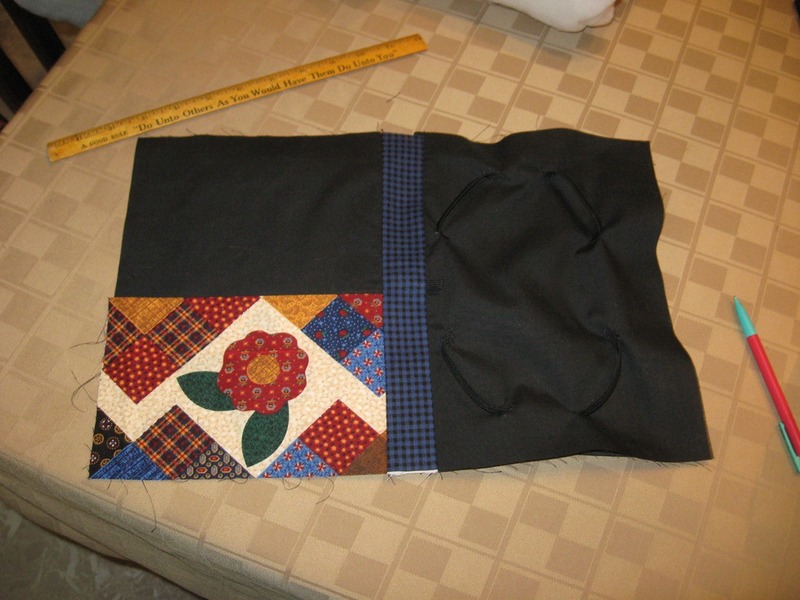 One piece is the cute fabric, another is thin quilt batting, and another piece of black to hold it together. Unfortunately, my fabric wasn’t as tall as the book, which made it difficult. The important thing now is to remember to sew on the button. I didn’t remember until I had sewn around 3 sides, and it made it much harder. Now, apparently a sewing machine has a zipper foot, which would have made this next step much easier. Use it to sew through all layers of the fabric, inside and outside, making sure to sew down the remaining 2 sides of the pocket. Stay as close to the book cover as possible without sewing it in. Remember that the cover will have to be wider to accommodate the book’s movement when it closes and plan for this. This is also a good time to sew the loop for the clasp. As you can see, I didn’t. It can be added with the binding, but doing it now would make it more secure. 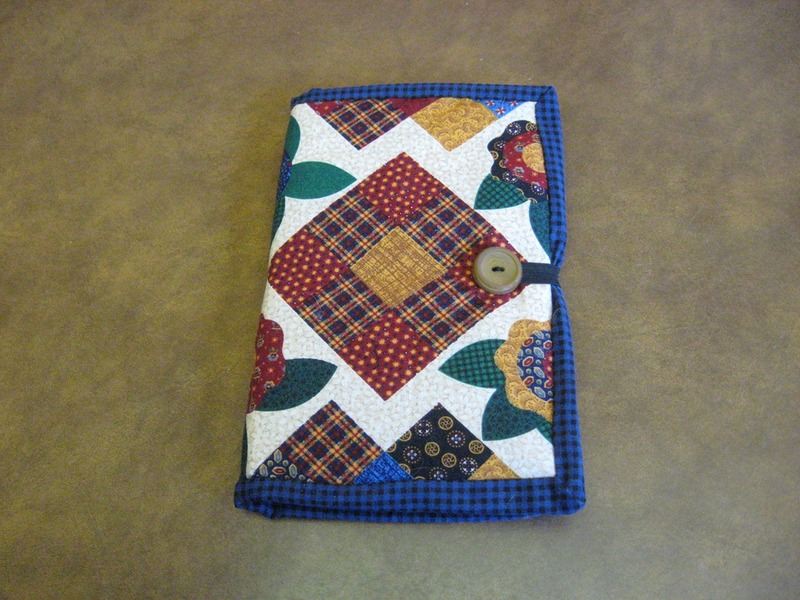 I sewed a 2.5” wide strip of fabric on the inside and added the clasp loop. 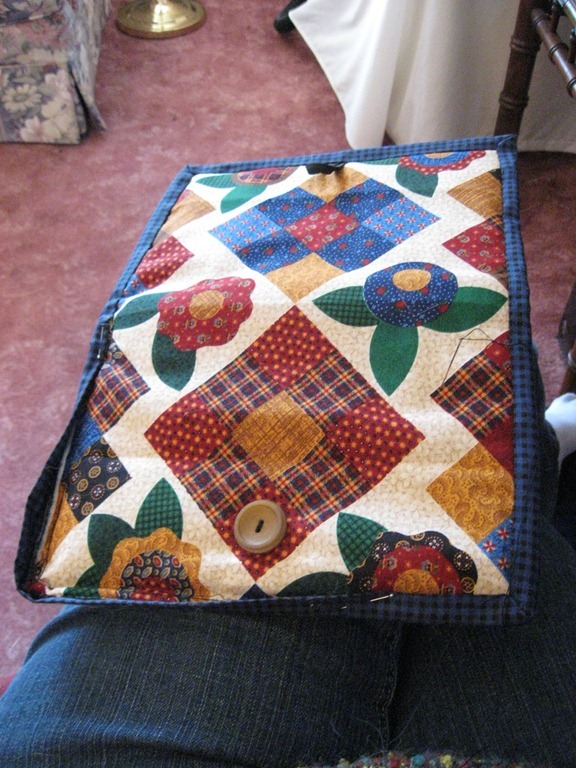 Then I hand-sewed the outside of the binding. 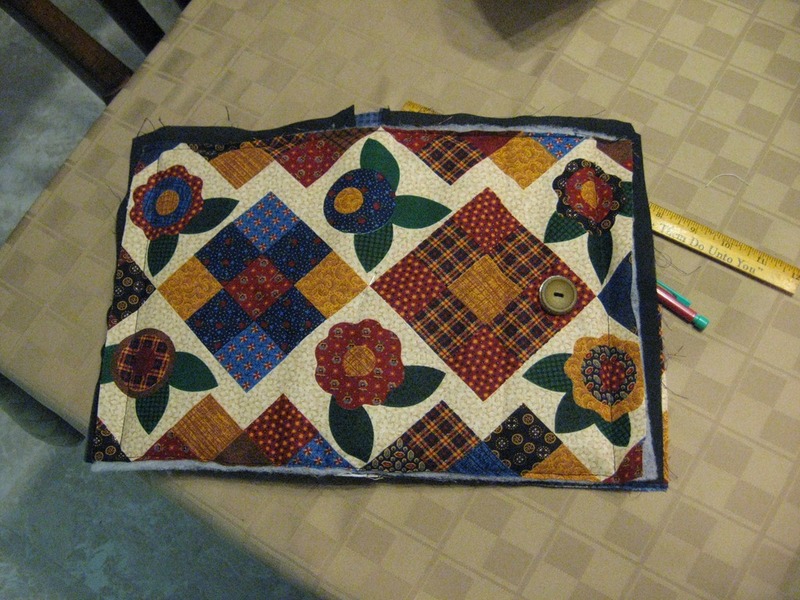 For those who don’t quilt, there is a great binding tutorial. I can do it well enough to get by, but certainly not well enough to teach it. And here is the final product. It was quick and relatively easy. Concept to completion took about 7 hours of actual work, and now a have a totally unique cover. This project was aided by many. The button and needle I used were my grandma’s, the elastic and batting were my mom’s, and the lining came from my second mom, Kristi Medina. My dad gave input on the use of spray adhesive, and my mom gave me sewing machine pointers and a refresher on the binding. I hope this gives you some great ideas. Let me know if you try it, I would love to see pictures too! It really did turn out nicely–good work! Thanks, I haven’t done a lot of sewing, so this was certainly a learning experience.